The Christmas season is here and it’s officially time to start buying some gifts for the ones you love. I’m kicking off this holiday gift guide by sharing the best stocking stuffer ideas for toddlers. Shopping for stockings is my absolute favourite because it forces you to get really creative and surprise someone with cool items that will fit or almost fit into a stocking! And there are so many nice toys, clothes, and trinkets out there for children right now. 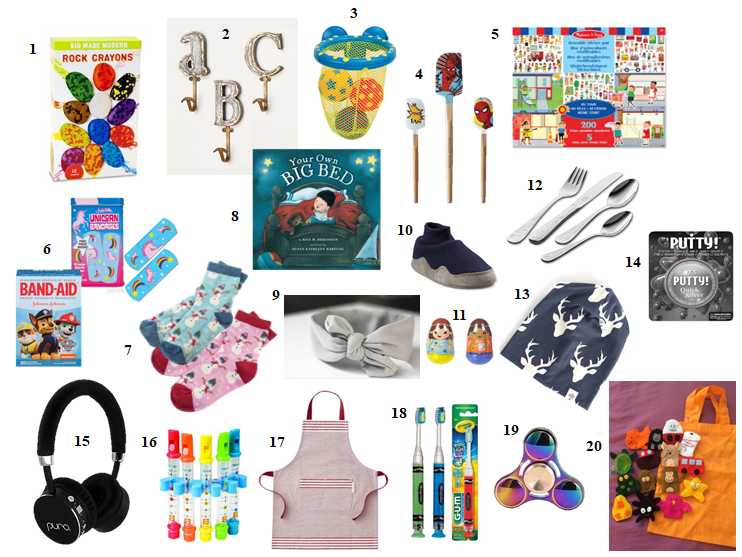 I’ve rounded up my top 20 stocking stuffer ideas for toddlers. Here are some great options for boys and girls that are affordable, stylish, fun, and safe. With Black Friday coming up I’m sure lots more will be on sale so watch out for those deals! Rock Crayons – colouring never gets old and these rocks are unique and easy to hold for your littles. Marquee Letter Hook – I love these hooks from Anthropologie. Put your child’s initial up in their room or even use these letters as hooks for the whole family in the mud room. Baking Utensils – try these cool Marvel Spider-Man Silicone Spatulas or you can find other ones here! They’re the perfect shape for a stocking. Melissa & Doug My Town Reusable Sticker Pad – every child loves stickers and this pad offers hours of entertainment because you can use them over and over again. Great for boys and girls! Fun Bandages – like these enchanted unicorns or go Paw Patrol. Little Blue House by Hatley Kids Socks Vintage Holiday Pink – these snowmen are sure to be a fun hit for the winter season. You can also grab them in blue for the boys. Your Own Big Bed – I like the idea of putting how-to books in your child’s stocking to help them get through a milestone at this age. I.e. how-to graduate into your own big bed or how-to use the potty or sayig bye-bye to the soother. Wylo + Co Bamboo Fleece Half Moon Knot Headband – little girls love wearing accessories so snag one of these soft headbands. They’ll fit perfectly in a stocking. Toddlers’ Fleece Slippers – these slippers from L.L.Bean are cute, cozy, non-slip for active kiddies, and actually STAY ON! Playskool Weebles – weebles are cool because they don’t fall down and they are durable for play. Zwilling J.A. Henckels – Twin Grimms 4 pc Children’s Flatware Set – I have this set for my boys at mealtime and it is the nicest quality silverware. It’s the perfect size for when your child has graduated from baby spoons. This utensil set is just the right size to hold, smooth, not too sharp, and dishwasher safe. You can also find these at a specialty kitchen/cookware shop. WildRoots & Co. Beanie – I love all beanies by WildRoots & Co. Lots of great prints to choose from. Check out this shop asap. It’s Putty Quick Silver -this putty is pretty cool because you can cut it, bounce it, pop it, and sculpt it. Fun entertainment for children and adults. Puro Sound Labs Kids Wireless Headphones BT2200 – currently the safest headphones on the market for toddlers and kids. Safe volume control for listening, they fold flat for traveling and the cord doesn’t tangle. Water Flutes – these bath toys are fun and the perfect shape for the stocking. Williams Sonoma Bay Stripe Kids Apron – they have lots of cute options here and are always having 20% off one item making it a good price to buy. GUM Crayola Timer Light Toothbrush – a light-up toothbrush makes brushing more fun and keeps them brushing for the recommended time. Fidget Spinner – good size gift for a stoking stuffer. These spinners are all the rage these days and the perfect distraction for your little one. Great to throw in your bag and take on the go in the car or at a restaurant. Finger Puppets – I love this finger puppet song bag from J & E Learning on Etsy. It’s wonderful for your child’s imagination and development during song time. *If you found this post helpful, please click below and vote for The Shop Guide. Thank you! Ah you’ve done it again! Love everything on here! Especially loving the spatulas and apron for our little bakers. The Henckels flatware set is a great gift idea too because it’s something I never think to buy, but we use every day! Love love love these ideas! So glad you like them! Thank you!